I run it on a VMWare Workstation 6.5 inside Windows 7 32-bits. The virtual machine is 64-bits, of course. My first impression is that SP2010 is so memory-hungry!!! Much more than the MOSS 2007. 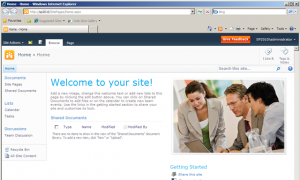 The Day Has Arrived: SharePoint 2010 Public Beta Is Here! For the MSDN Subscribers only, for the moment. Posted on November 17, 2009 January 19, 2015 Categories englishTags sharepoint 2010Leave a comment on The Day Has Arrived: SharePoint 2010 Public Beta Is Here!